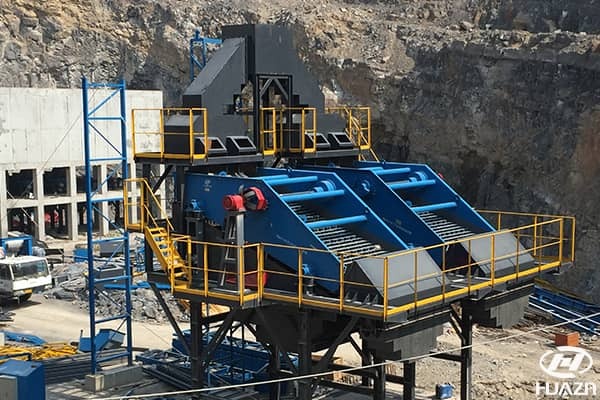 Vibrating screen has the characteristics of reliable structure, strong exciting force, high screening efficiency, small vibration noise, strong durability, and convenient maintenance, which is widely applied for the product classification in mining, building materials, transportation, energy, chemical and other industries. 1. The motor shall be fastened on the mounting surface, which shall be smooth and flat. 2. The motor can be installed horizontally. 3. The motor should be ground. The motor has a grounding device, the lead end has a sign, and also can use the foundation bolt for grounding. 4. Adjustment of excitation force. 1. The machine shall be equipped with electrical protection device. 2. At the beginning of operation, check the anchor bolts to prevent loosening. 3. When the motor rotation direction does not meet the requirements, adjust the power phase sequence. 4. The motor shall be well lubricated. Lithium base grease (zl-3) shall be added every two weeks. When adding oil, add proper amount of lithium base grease through the oil cup. 5. After the accumulative running of the machine for 1500 hours, the bearing should be checked and replaced immediately if there is serious damage. 6. When the machine is used again after being stopped for a long time, the insulation resistance shall be measured. (1) Check whether the thick and thin mesh is damaged. (2) Check whether each set of beam rings is locked. (1) Pay attention to whether there is abnormal noise. (2) Whether the current is stable. (3) Whether there is no difference in vibration. Previous Article：What Equipment is needed for Sand Making Machine Production Line?